It should not be a hilar mass or adenomegaly. Can you tell me why? Yes, and more. Look at the lateral film. 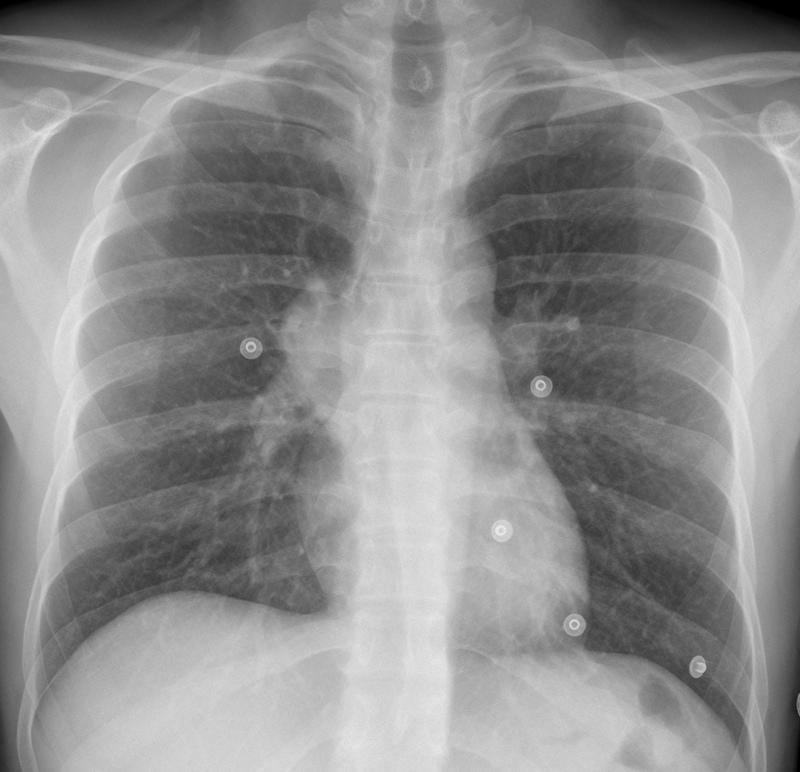 Right hilar mass, in lateral view it appears extrapulmonary, hilar based anteriorly and well defined posteriorly. Trachea is central, patent right and left main bronchi. 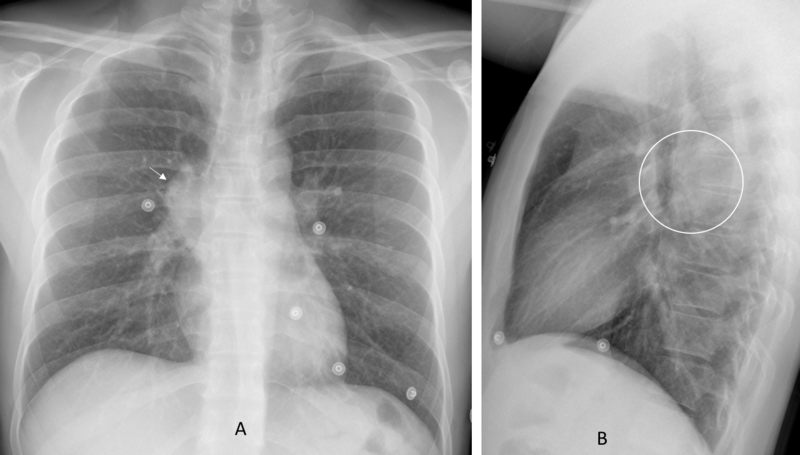 It is solitary well defined middle mediastinal lesion, mostly bronchogenic cyst, can be Pericardial cyst. less likely vascular origin or LN. It is not pericardcial cyst for sure. 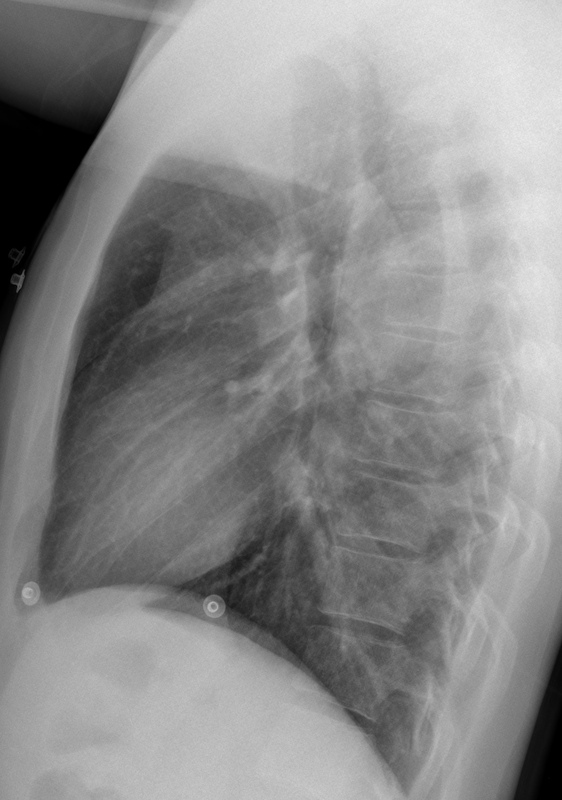 Thickening of posterior wall of bronchus intermedius. 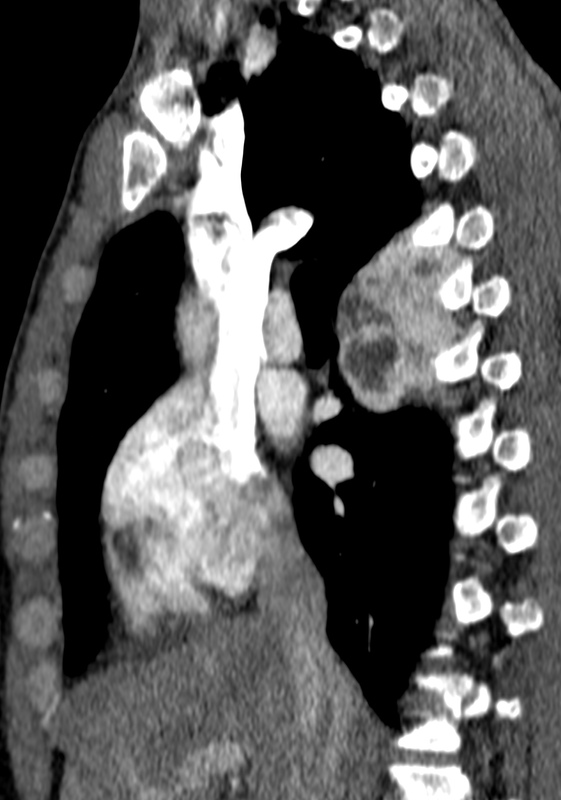 Mass-like lesion between trachea and oesophagus. On lateral view seen overlying D5-D7 vertebrae suggestive of pathology in Superior segment of right lower lobe. it is in my opinion a posterior mediastinal mass, located in upper part at the level of T1 to T3/T4 vertebra, posterior and separate from trachea. There is long list of differentials like foregut duplication cyst, neurogenic tm, infection of vertebrae or posterior ribs , infection of posterior mediastinum.No obvious vertebral erosions/ neural foramina widening seen. Could be diverticula arising from upper oesophagus. 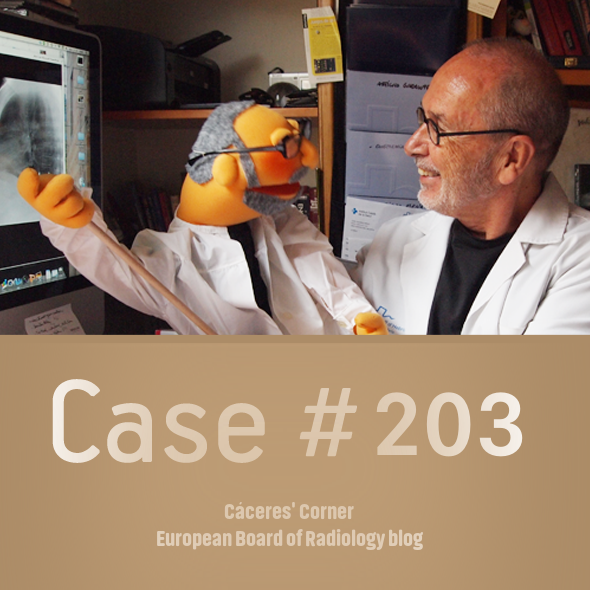 There is a right parahiliar lesion and in tle lateral view I think it´s extrapulmonary, so we have a medium mediastinal lesion (posterior to the trachea). I think it colud be a broncogenic cyst. 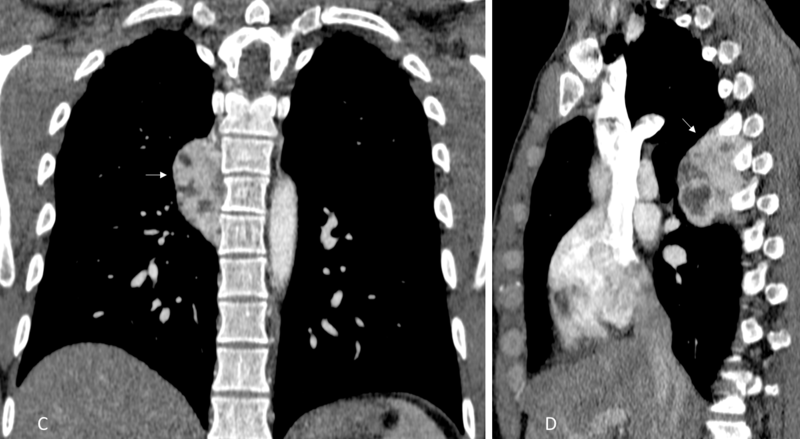 Paraspinal heterogeneous mass in posterior mediastinum with anterior expansion. No evidence of bone destruction (no bone window available). Small lesion nonenhanced in spleen (could be a cyst). History of hematologic disease? Extramedullary hematopoiesis? 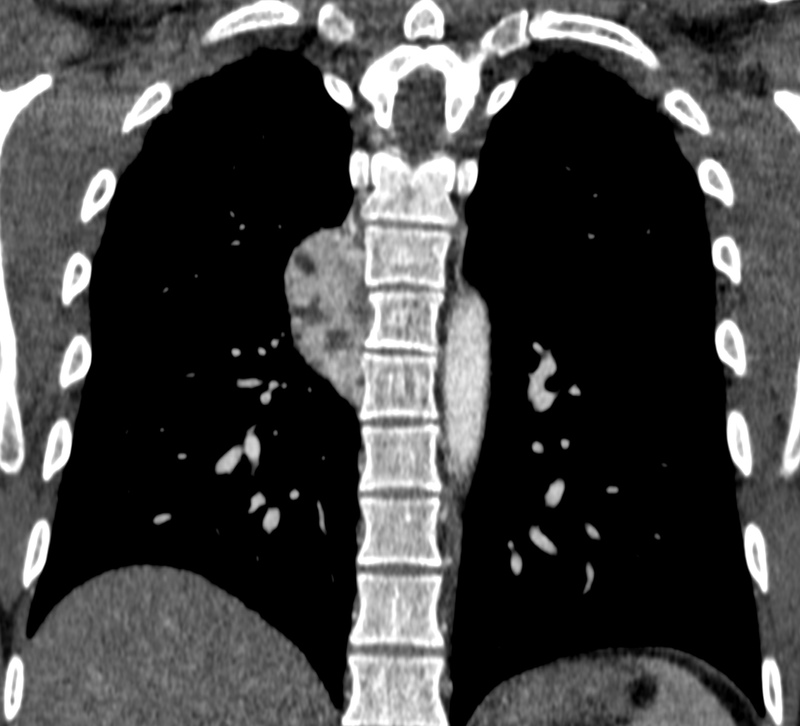 Posterior mediastinal heterogeneous mass. Avid enhancement. No costal destruction.